1. Pour water into large mixing bowl and dissolve yeast into the water. 2. Add flour one cup at a time and salt ½ teaspoon at a time and mix after each add. 3. After flour and salt is thoroughly mixed, cover bowl with plastic wrap and allow to rise for at least eight hours. 4. Dust surface with flour and dump dough onto the surface. Fold the dough over itself a few times then cover loosely with plastic wrap. Let it sit for 15 minutes. 5. Remove plastic wrap and shape dough into a ball. 6. Place dough in a proofing basket dusted with flour (or just leave it on a surface dusted with flour). Cover with a dry towel and let rise for 1 to 2 hours or until the dough doubles in size and doesn’t readily bounce back when poked. 7. While the dough rises, heat the oven to 475°F. Thirty minutes before the dough is ready place a 6 quart cast iron dutch oven into the oven. 8. Carefully place the dough into the hot dutch oven and bake for 30 minutes. 9. Remove the lid of the dutch oven and bake for another 15 minutes to darken the crust. 10. 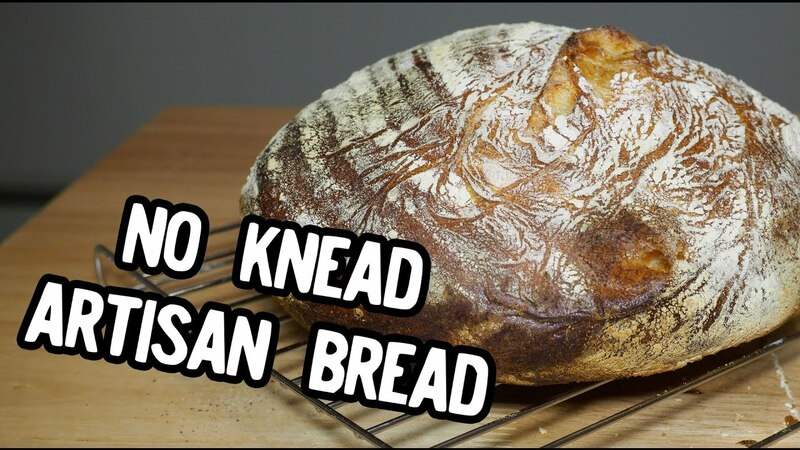 Dump bread onto a wire rack to cool and then enjoy your delicious bread!